This is a quick dessert if you have prepped your pudding in advance. If not you need to allow the pudding one hour to set. Prepare vanilla pudding per recipe, needs 1 hour to set. Combine the pumpkin, cinnamon, ginger and allspice. Fold pumpkin mixture in to the pudding. Fold in 1/2 cup whipped cream. Transfer to individual serving dishes, refrigerate until serving. 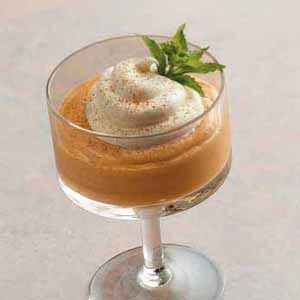 Garnish with remaining whipped cream.